Russia has offered its latest aircraft carrier design, Project 23000E Shtorm to the Indians. That's according to a senior Indian Navy official speaking to Defense News. The offer came amid discussions between India and the United States on the prospects for the transfer of military technology for India's future nuclear-powered aircraft carrier, Defense News' India bureau chief Vivek Raghuvanshi explained. A diplomat at the Russian Embassy in Delhi confirmed to the newsweekly that a delegation of Russian officials had visited India last week to make the offer. Last year, the St. Petersburg-based Krylov State Research Center and Nevskoye Planning and Design Bureau showed off a model of its new prospective 100,000 metric ton displacement nuclear aircraft carrier, designated the Project 23000E Shtorm ('Storm'). The massive aircraft carrier design envisions transporting up to 90 aircraft, including MiG-29 and T-50 (PAK FA) fighter aircraft, early warning aircraft, and Ka-27 helicopters. Designed with two landing strips, the 330 meters-long carrier would enable planes to take off and land almost without interruption. Capable of serving in frigid temperatures, the prospective carrier's hull design also allows for a significant reduction in water resistance. For air defense, the prospective carrier is expected to be equipped with Russia's next generation air defense system, the S-500 surface-to-air missile system, currently being developed by the Almaz-Antey Air Defense Concern. The Krylov Center presented its latest designs: the aircraft carrier 'Shtorm' and the destroyer 'Shkval'. ​Speaking to Defense News, the unnamed senior Naval official described the carrier, pointing out that it is "designed to conduct operations in remote and oceanic areas, engage land-based and sea-borne enemy targets, ensure the operational stability of naval forces, protect landing troops, and provide anti-aircraft defense." India, Raghuvanshi wrote, currently "plans to build its second homegrown aircraft carrier, [the] INS Vishal, which will be nuclear-powered, 300 meters long, 70 meters wide and displace 65,000 tons." Russia and India have a fruitful history of defense cooperation. 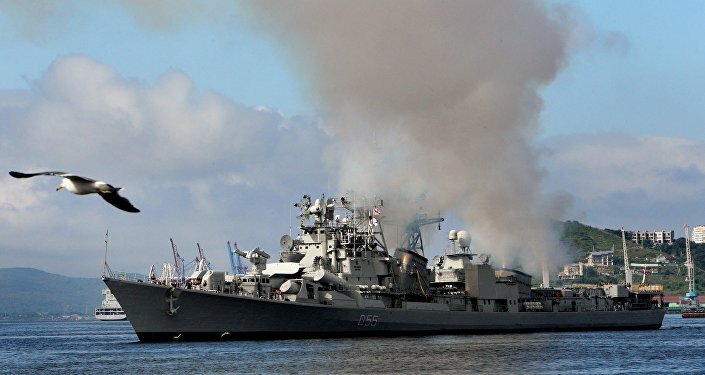 Between 2004 and 2013, Russia assisted the Indian Navy with the overhaul and deep modernization of a Soviet-era Kiev-class carrier-cruiser purchased from Russia and renamed the INS Vikramaditya. According to independent defense analyst Nitin Mehta, through this process Indian designers "gained valuable insights into carrier-building techniques." According to the Indian Navy official, India was recently attracted to a US offer to provide Delhi with the technology for an electromagnetic aircraft launch system (EMALS), which is unavailable on the prospective Russian carrier. India and the US have recently formed a 'joint working group' on carrier technology. However, according to Raghuvanshi, there has been no discussion regarding US carrier-based nuclear propulsion technology being offered to India. Delhi has yet to decide whether to purchase a ready-made carrier or to build it locally, and there are still doubts whether the necessary funding will be made available by the Indian government. Speaking to Defense News, retired Indian Navy Commodore Anil Jai Singh questioned whether the country really has "the kind of global footprint to justify that expense in the next 15 years or so." An anonymous Indian Ministry of Defense official confirmed that Delhi has yet to finalize details on how to procure its homegrown carrier. According to one defense analyst, Russia's Shtorm carrier concept is the closest prospective competitor to America's brand new Ford-class carrier.